Blue Raster is pleased to announce the release of the new version of HealthLandscape, an interactive web-based mapping tool for healthcare providers, advocates, researchers, and policy makers. HealthLandscape Version 3, which was launched in October, enhances the power of this award-winning GIS application, which allows healthcare professionals to combine, analyze, and display health information in ways that promote understanding, improve outcomes, and reduce cost of healthcare. In July 2011, HealthLandscape and UDS Mapper took first place in the Web-Based GIS Application category at the Esri International User Conference’s User Software Applications Fair. Blue Raster upgraded HealthLandscape from a legacy server system (ArcIMS) to ArcGIS Server and Flex API to provide users with more dynamic applications and greater functionality. 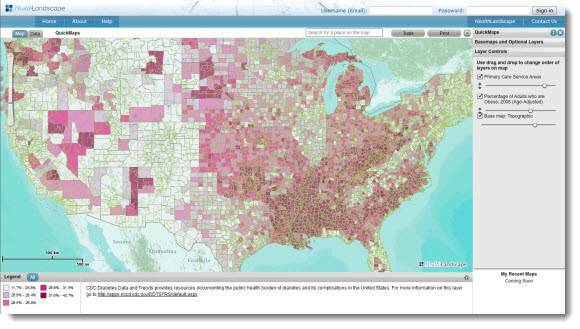 Most notably, HealthLandscape’s anthology of health-related tools can now be combined, enabling the user to use them all in one mapping viewer. Users can turn tools on and off depending on their data needs and display layers from multiple tools on the map at the same time. The new version also makes it easier for healthcare professionals and advocates to combine their own data with existing health maps and public sources of health, socio-economic and environmental information. Using the new QuickGeocodes tool, users can upload data from Excel spreadsheets to create instant health maps. They can also use the new QuickThemes tool to upload state, county or zip code-level data to create thematic maps that show how health information varies from region to region. Visit HealthLandscape and see for yourself how it conveniently brings together and communicates critical health information and trends with compelling custom maps.